You need only turn on the TV to know that race remains a key issue in America. From Charleston to Baltimore to Ferguson the headlines have made one thing very clear: there is still work to be done. That is why we were honored to attend A & E Networks and iHeart Radio’s Shining A Light concert. Shining A Light: A Concert for Progress on Race In America took place this Wednesday night at the Shrine Auditorium in downtown Los Angeles. 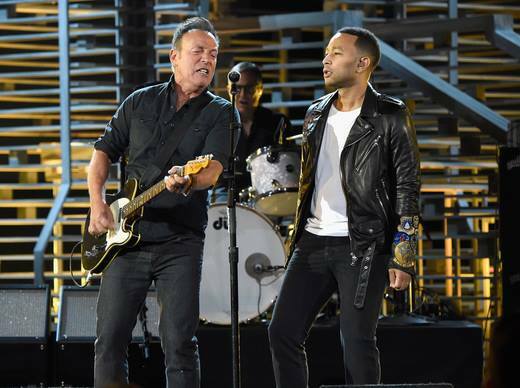 The event brought together some of Hollywood’s biggest names including Pharrell Williams, John Legend, Sting, Bruce Springsteen, Pink, Jamie Foxx, and more. This two-hour special and fundraiser for United Way airs on various A+E Networks (A&E, History, Lifetime, FYI, LMN, H2) tonight, November 20th, at 8/7c. What made this benefit concert like no other was that it wasn’t just a bunch of A-list performers and presenters merely showing up in support of change; it featured this talent actually becoming the change. In between songs there were short documentary-style segments with footage of these artists visiting places of racial conflicts. Pharrell Williams walked through the historic slave markets of South Carolina and led a town hall discussion at Mother Emanuel church where churchgoers joined him in a rendition of his hit song “Freedom.” Alicia Keys visited the mothers of Baltimore who had lost their sons to racial violence and traveled to DC to report her experiences before government officials urging them to implement change. John Legend visited Ferguson to speak to the wives of police officers and offer their perspective on what it has been like to watch their husbands serve the community while also be turned into the villain. The concert opened up a very important dialogue about race in America from all perspectives and urged grace, love and understanding at a time when now more than ever, we need it both socially and politically. As for the show, the performances echoed this sentiment. 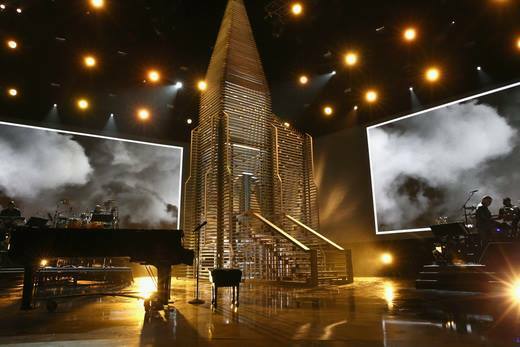 The show opened with a stage setup of a wood-framed church conjuring the Mother Emanuel AME Church in Charleston, SC, the scene of a tragic shooting earlier this year. 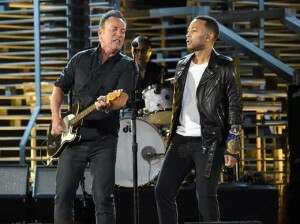 The live show opened with Bruce Springsteen, joined by John Legend, performing his song “American Skin (41 Shots)” backed by an all-star choir featuring many of the night’s performers including Aloe Blacc, Ed Sheeran, Big Sean, Eric Church, Nick Jonas, Miguel, Pink, Jill Scott and more. We were later told this would be the taped finale. Morgan Freeman was one of the first presenters who urged that “Tonight must not just point out problems but point out solutions. We all need to do more to further the kind of conversation that must unite us on this common ground we call America.” He went on to later quote world leader Nelson Mandela saying “It always seems impossible, until it’s done.” He was the first of many celebrity presenters that introduced each performance and included LL Cool J, Chrissy Tiegen, Nicki Minaj, and George Lopez. Minaj recited Maya Angelou’s infamous poem “Still I Rise” and George Lopez, in typical Lopez fashion, went off teleprompter for some political jabs at Donald Trump. “Demographics are changing everday in this country and you can build a thousand walls, a hundred feet high and it won’t change that…cause we got tunnels! So can someone let Donald Trump know,” said Lopez in a moment of levity. Other moments in the show brought the heavy, like Jill Scott, who performed a piercing rendition of “Strange Fruit,” an anti-lynching song from 1939 with a graphic visual backdrop of lynched slaves. 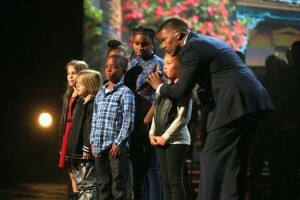 One of the most touching moments of the evening came from Jamie Foxx who sang the gospel tune “No Weapon,” while standing amongst some of the children who have been affected by racial violence. His own daughter was also on stage and gave an impressive recitation of all the stories of the Bible as her proud father looked on. Our favorite rock star moment of the night came from Miguel and Tori Kelly who sang a powerful “Free Your Mind,” as the crowd stood and danced along. During the show, the audience was encourage to text 91999 to donate and become a part of the discussion and change our country so imminently needs. Be sure to tune in tonight for your opportunity to support. 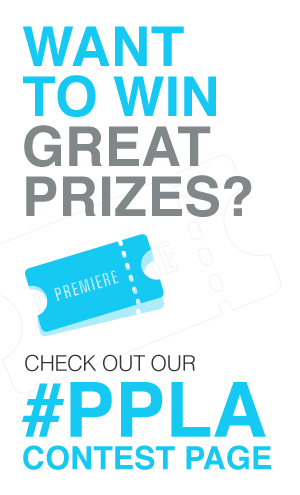 Visit Shining A Light on A & E Networks.